70 minutes is a long time in Gaelic football. That's all it took for Mayo's All-Ireland title odds to be halved. Meanwhile, Kerry came into last weekend's game on the cusp of a wave and left with the concerns of yesteryear remerging. A scoreline of 3-11 to 2-10 only tells part of the story. In the aftermath of the league final, many pointed once again to Kerry's defensive plan and the weakness within. But what exactly is their plan? When Peter Keane was unveiled as Kerry manager, he made two shred acquisitions; Tommy Griffin and Donie Buckley joined the coaching ticket. Griffin cut his teeth in the underage schools game before progressing as a selector with the county minors. 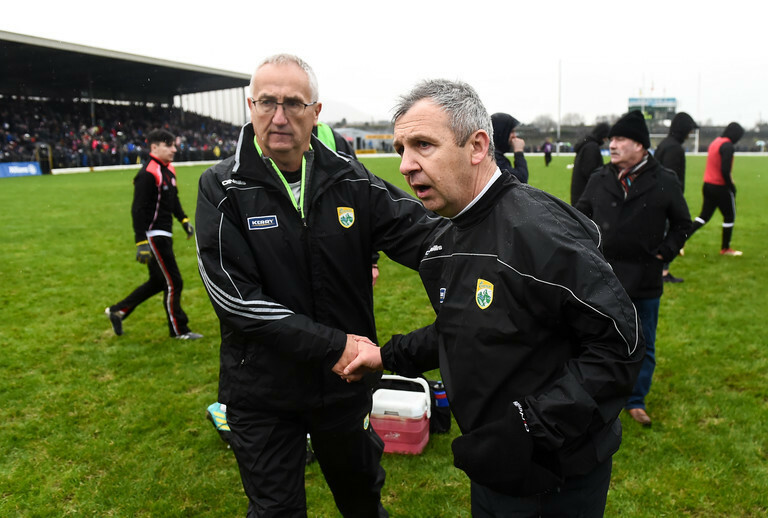 When Kerry overcame Dublin last February, more than one observer on the terraces of Austin Stack Park pointed out that Kerry's style bore huge similarities to that of his former teams. Then there is Donie Buckley, a retired civil engineer who brings the same attention to detail and precise planning required there to his own training. Hailing from Castleisland, Buckley worked with the Kerry footballers until 2012 when he left just prior to the Munster championship, to the disappointment of many squad members. In 2012, James Horan rang Buckley and encouraged him to join his coaching ticket for the following season. Several Mayo players have labelled him the best coach they have ever worked with. He left last year to return to Kerry. As Jason Doherty told Balls.ie earlier this week, Buckley will surely work his magic down south. There's no doubt, Donie was excellent for us and Mayo football. I have a huge amount of respect for him. We knew well that there are elements of Kerry's game that will improve further because of him. There's plenty of nights doing box-drills tackling that I'm sure the Kerry boys are going through now! The notion that Kerry do not have a defensive plan, or the one that exists isn't effective is inaccurate. While they've experimented with different systems, last Sunday was a significant insight into their plans moving forward. The first half, in particular, was telling. First, Kerry played with two inside forwards: Tommy Walsh and David Clifford. Ahead of them was Kevin McCarthy, operating closer to the half-forward line to make breaks, open space and feed the ball inside. Walsh and Clifford maintained shape for the vast majority of the game and are under instruction to never venture deep in search of possession. When you analysis where they got on the ball, it reveals as much. With the ball, they are Kerry's most potent attacking option. The issue arises in their role without it. 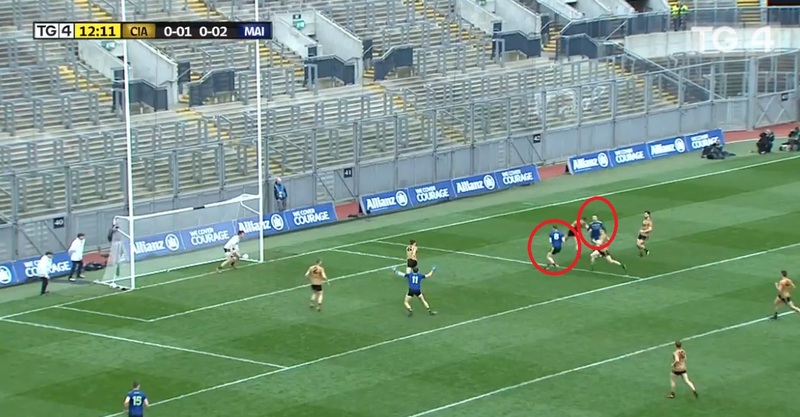 Mayo are a running team with players liable to attack from anywhere. 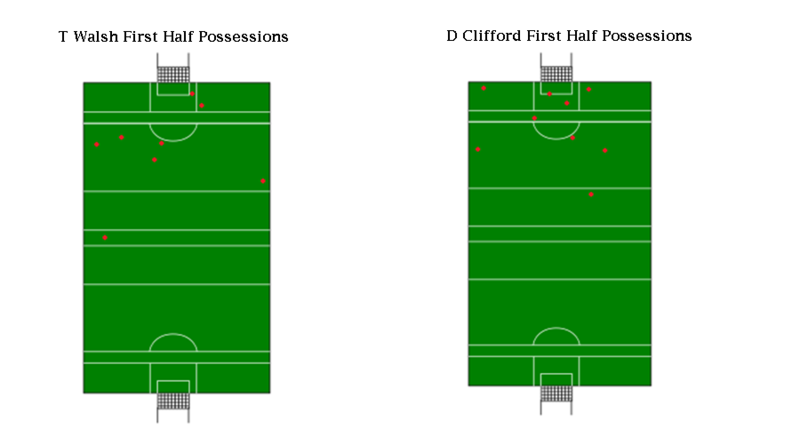 However, asking David Clifford to make repeated 60-yard tracking runs after Brendan Harrison is counter-intuitive. It's robbing Peter to pay Paul. That's not to say Clifford does not have a role defensively. This is not NFL with an attacking gameplan and a separate defensive gameplan, they are interlinked. His role is to press high up the field, like he did midway through the first half to great success. A ball is delivered in long, Brendan Harrison collects. Clifford tracks him and gets in a strong near-arm tackle. Harrison dives on the loose possession, Clifford forces a free for O'Shea to convert. In an ideal world, Clifford would deliver countless turnovers in this area of the pitch. Obviously, that is not realistic. 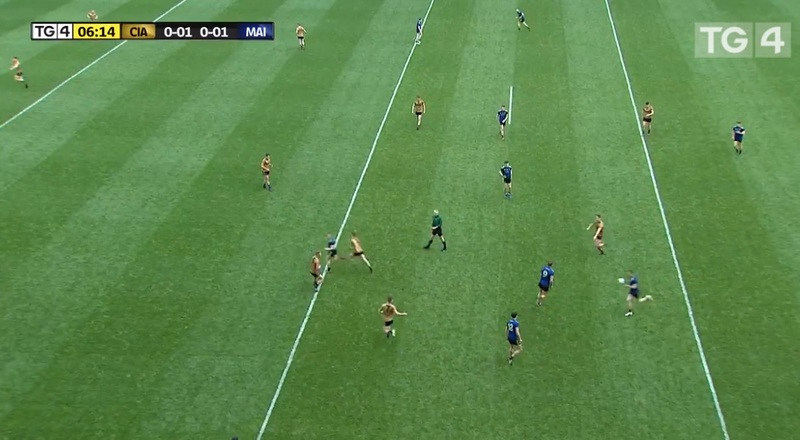 Yet when Mayo move the ball forward, Walsh and Clifford do not track the runner and instead assign it to one of their incredibly hard-working half-forward line. This happened on numerous occasions in Croke Park last Sunday. Walsh or Clifford would point to their man, ensuring they could conserve their energy while their opposition is not left free. Tommy Walsh shouts for his team-mates to cover his run and holds his position. Clifford points to the runner and makes sure he is tracked, then heads back up the field. Kerry's shape relies on a hard-working half-forward line who can come deep to defend and an inside forward line who hold their positions. The third element is a centre-back who holds the centre. The man selected for this role last Sunday was Paul Murphy. Over the last number of years, a familiar sight has been Murphy driving forward and his ability to attack. In this system, that is not his role. Kerry have countless players who can fulfil that spot but very few who can cover defensively in the same way Murphy can. It is clear he is under strict instruction not to venture forward. Consider this moment in the 17th minute. Sherwood was in trouble, so Murphy offers himself with plenty of space ahead of him. He carries forward and delivers a kick pass inside. 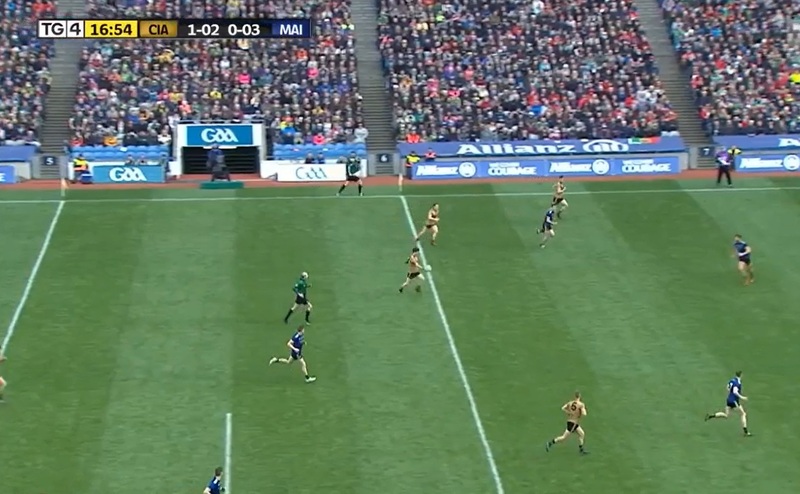 Kerry are attacking and could use an extra man, but that's not Murphy's job. He turns around and heads right back to mind the centre. As aforementioned, attack and defence are interlinked. There are positives and negatives to this system but it's clear it can reap dividends, particularly when you consider Kerry's opening goal. 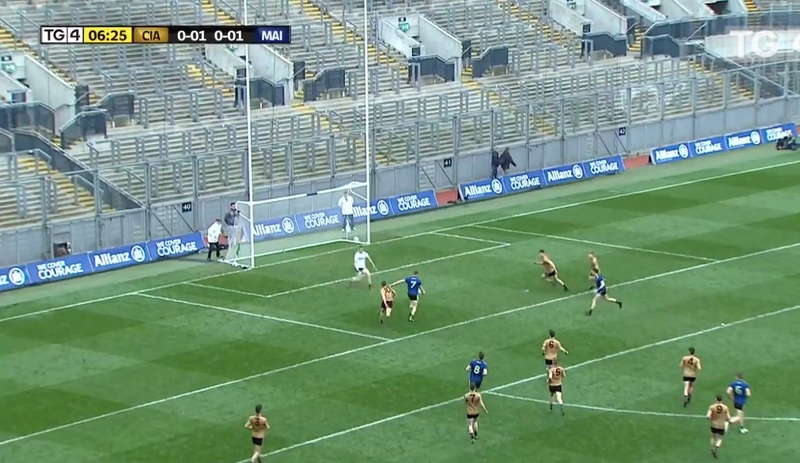 The goal came directly after Mayo's third point, a fisted score by Matthew Ruane. At the start of the play, Kevin McCarthy is tackling on the '65 having just pressed Keegan. Note the position of Ruane and Keith Higgins. Right now, McCarthy has two options. In a different defensive system, he'd retreat behind the ball to offer the safety that comes with numbers and cover any loose runners. But like Clifford and Walsh, he is only supposed to press to a certain point. When Kerry get possession back, they will need a link man on the half-forward line to feed the inside duo. So McCarthy stops, Higgins and Ruane continue and work a score. It seems counter-intuitive. Kerry could have stopped a point with another man back. Yet in the grand scheme of things, it pays off. Just look at what happens next. Shane Ryan kicks the ball out. The ball goes to the '45 where McCarthy is ready and waiting. He delivers it inside to Clifford who beats his man and feeds Crowley. Goal. Despite this, Peter Keane's outfit conceded three goals. Any system is only as good as its components and unfortunately, two individual errors directly resulted in goals. 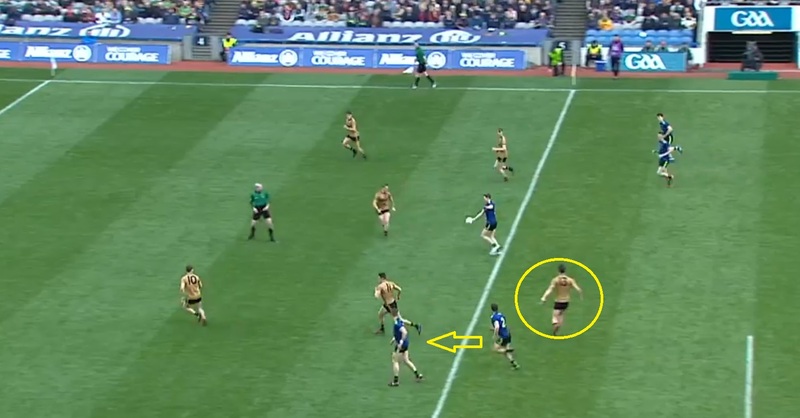 One was a goalkeeping mistake, the other was an inability to track a runner due to Graham O'Sullivan cramping up. Yet there is cause for optimism. After all, the Kingdom didn't build a brand new shiny centre of excellence in Currans to use it as infrequently as they did during the early portions of the league. Given the current state of the Munster Championship, Kerry will not need to peak until July and management are keenly aware of that. The other issue is the lack of a platform. 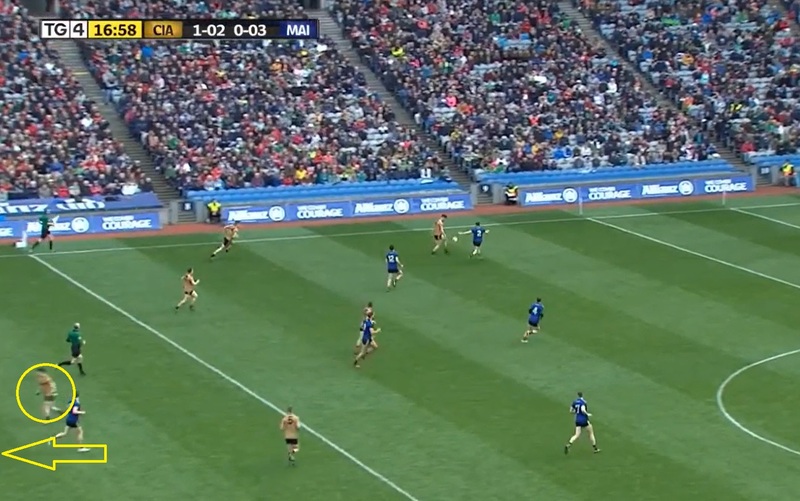 Mayo's midfield gave a masterclass in this area. 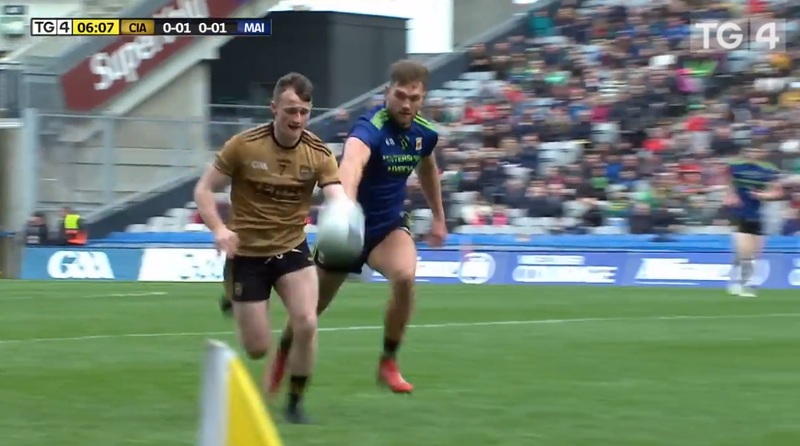 Whether it be their ability to cover defensively and secure turnovers or drive offensively and deliver passes inside, Mattew Ruane and Aidan O'Shea, in particular, gave an exhibition. 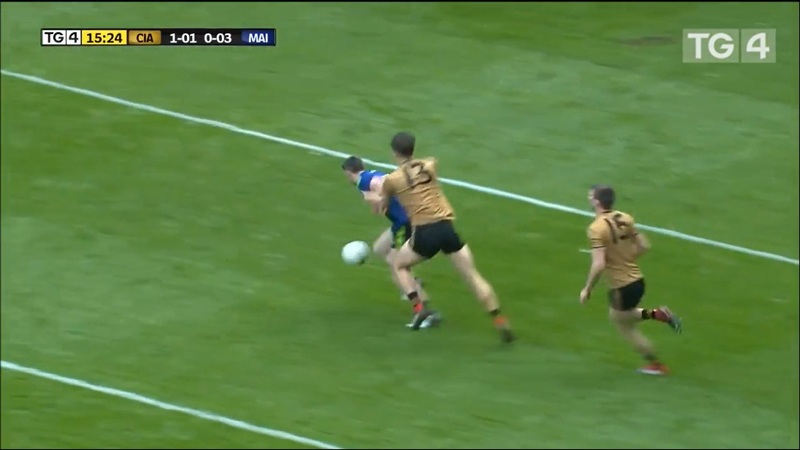 Kerry kept Mayo scoreless for a 12 minute period in the first half (12.14-24.31) and only conceded two points in 23 minutes of play but if you delve into that, the warning signs were there. Consider the following table of Kerry's first-half turnovers and who delivered them. 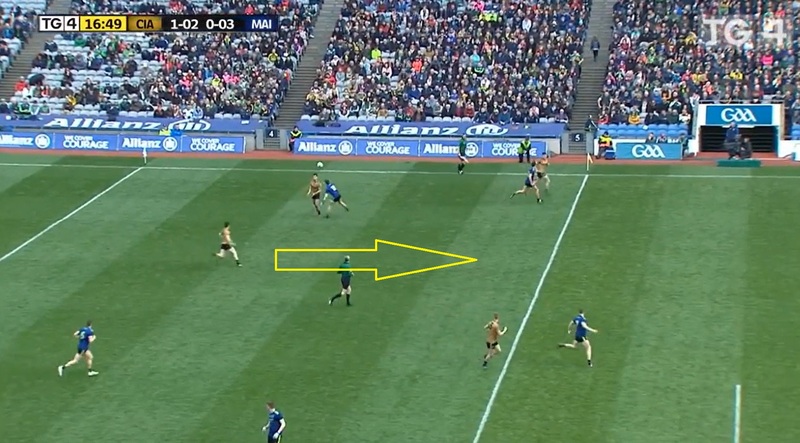 It paints a picture, Kerry's midfield did not turn over the ball once in the first half and that's a trend that continued into the second, finishing the game with none. After 24 minutes, Jack Barry did dispossess Aidan O'Shea off a throw ball but fouled him in the process. 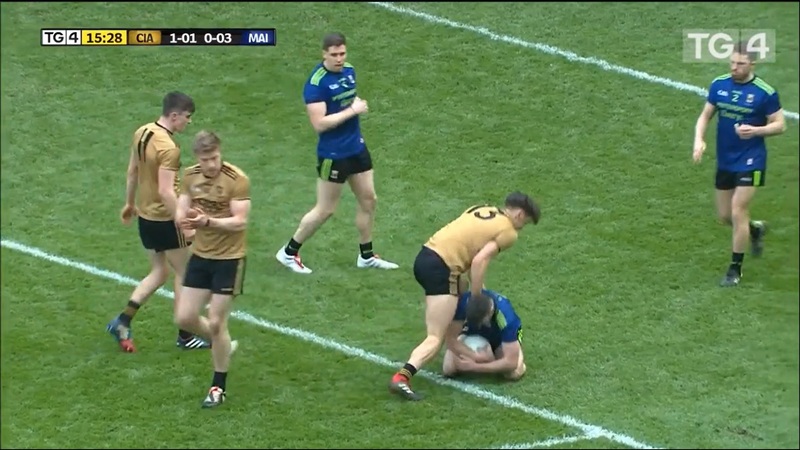 Diarmuid O'Connor did similar after 34 minutes and was given a yellow card for a poorly executed tackle. The fans who watched their side lose last weekend will be buoyed when they consider who is yet to return. The Mayo back eight will see minimal change come championship. In comparison, Micheál Burns, David Moran and Gavin White will certainly add to the already strong system. Barry and O'Connor are two good players who will continue to develop and one can only imagine how their tackling will improve once Buckley gets his teeth into them. 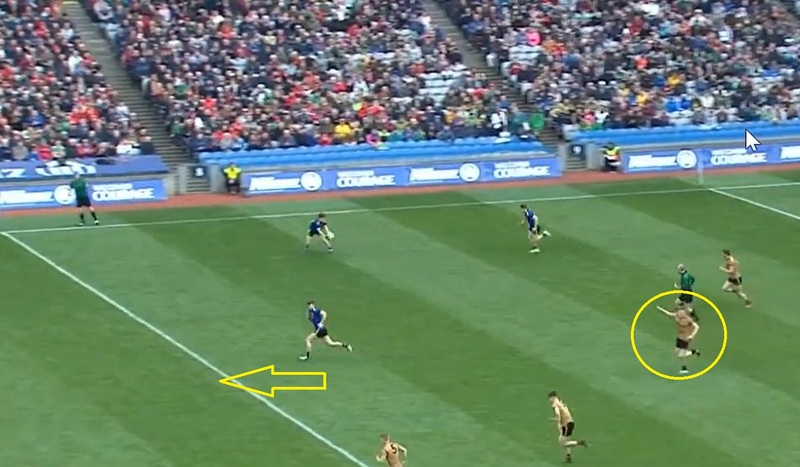 There was one moment that demonstrated exactly what Kerry need from their midfield and what Mayo already have. It too came in the first half. Tom O'Sullivan was roaring down the wing when he was met by Aidan O'Shea. O'Shea dispossesses O'Sullivan and immediately instigates an attack. He feeds Lee Keegan and the ball is delivered long. It ends with a great goal chance. It was a constant feature of O'Shea's game, with numerous stand-out kick passes ensuring it was a comprehensive performance. Kerry are not that far away, but the standard was set on Sunday. Their race to meet it ensures an exciting summer lies ahead.